February is American Heart Month so why not get Heart Healthy! N.C. Cooperative Extension, Franklin County Center is offering a new high blood pressure management program for adults created by the Community and Clinical Connections for Prevention and Health Branch of the North Carolina Division of Public Health. Know It, Control It is a community-based blood pressure management program designed to help participants self-monitor their blood pressure and make healthy lifestyle changes to control high blood pressure. Trained blood pressure coaches teach this program using evidence-based strategies to manage cardiovascular disease. Almost one out of every three adults in the United States (29% or about 75 million people) has been diagnosed with high blood pressure. Among adults 65 years and older, two out of three have high blood pressure and half of them do not have it under control. “All adults should consult with a health care provider, learn their blood pressure numbers, learn to self-monitor their blood pressure and take steps to get healthy,” spoken on behalf of the AHA. Know It, Control It classes are open to people who have been diagnosed with high blood pressure. During each class, blood pressure coaches will lead a discussion on a healthy habit that will help participants control their blood pressure. On class days, the blood pressure coach will also assist each participant with measuring and logging his/her blood pressure with the goal of having them become proficient at tracking and measuring their blood pressure on their own. Know It, Control It classes will meet every other week for a total of 8 classes over 4 consecutive months. Classes will begin on Thursday, February 14, from 2 – 3 p.m. at the N.C. Cooperative Extension, Franklin County Center, 103 South Bickett Blvd., Louisburg, NC. 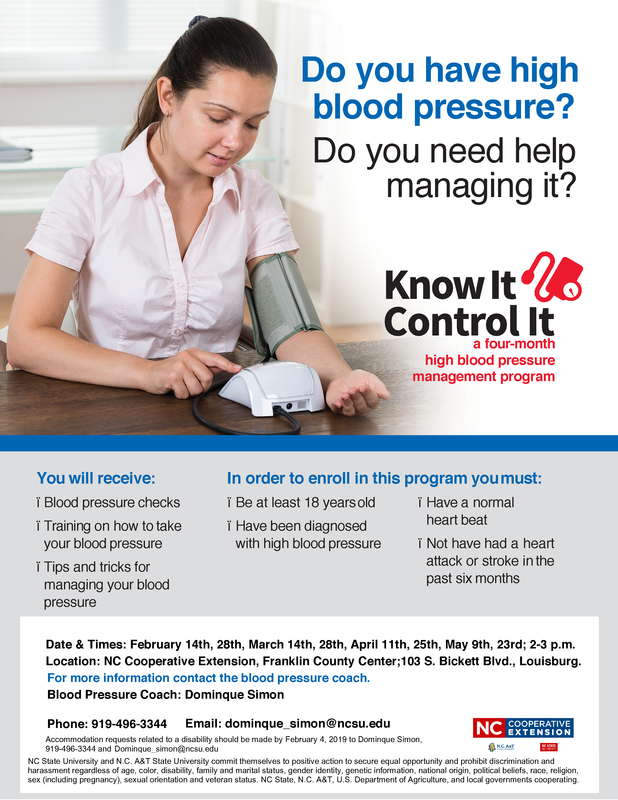 Learn more about the Know It, Control It High Blood Pressure Management program by contacting Dominque Simon, Family & Consumer Science Agent, 919-496-3344, dominque_simon@ncsu.edu. To register for Know It, Control It you can call 919-496-3344, email Dominque Simon at dominque_simon@ncsu.edu, or register online. • Guard Your Heart - Be Heart Smart! • Get to the Heart of the Matter, It Could Save Your Life! • It’s Your Heart; Take Care of It!